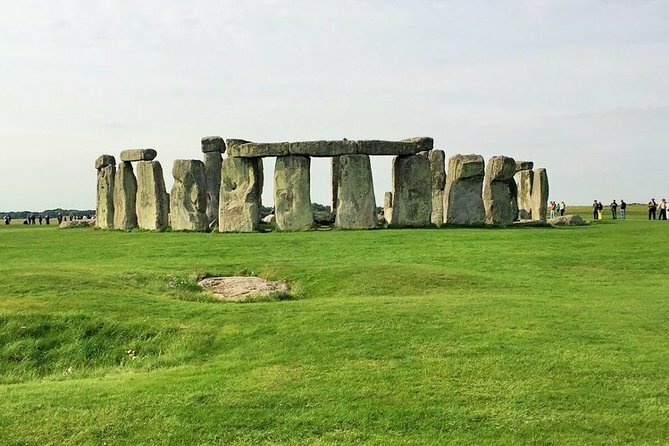 Visit Stonehenge, Bath and the English countryside on this full-day tour from London. Travel through scenic Somerset and the beautiful Wiltshire countryside with a guide. Visit two UNESCO World Heritage sites in one day. We depart early to beat the crowds and be one of the first groups to arrive at Stonehenge. We spend 90 minutes at Stonehenge with time to view the monument and explore the exhibition, with full priority admission included. We drive through some beautiful English Countryside, and your story-telling guide will entertain you on the journey. Enjoy 3 hours in the Georgian City of Bath, with an optional walking tour and free-time to visit Bath Abbey or any of the attractions of Bath. Arrive back in London at 6.30pm approx. Bath Abbey is a stunning Abbey in the heart of the city. Admission is not included. See this beautiful famous bridge while in Bath. Roman Baths are located in the heart of the city. Spend time visiting these ancient baths. The stunning Royal Crescent in all its glory, amazing architecture. Explore the area of these amazing stones and their symbolism. Admission included. Tour company providing the tour. Rosie our guide was great. It was nice she organized folks to make it run more smoothly. I liked that if u hold the group up u may b left behind. (Rude) Stragglers got the hint quickly. Great commentary along the English countryside. We were allowed to do what we wanted to do at both sites. Plenty of time at both sites. At Stonehenge I would reverse your loop if crowds permit. Start at end and go the other way. B sure to go into The Bath at Bath!! Great pubs in Bath. This tour was one of my favorite parts of our trip to London. B sure to get out of the city during your stay. TY Rosie!! This is the cheapest day tour comparing with other companies. It went really well, on-time and on scheduled. Thank you very much, Viator! The tour guide helped to make this the perfect tour. I really enjoyed being able to see these two amazing places and their information helped put the history into perspective. This was one of the highlights of my trip to London/the UK. It was a beautiful day trip that was expertly organized and timed. Rosie was a phenomenal tour guide and our driver was incredible. Rosie provided an excellent background of Stonehenge, commentary on the areas surrounding Stonehenge and Bath, and gave a wonderful walking tour of Bath, too. She has a beautiful, intelligent personality that is funny and witty. I highly recommend taking this tour! Our guide truly seemed to love Stonehenge and bath and was extremely knowledgeable. This trip was one of the highlights of our visit. Also, for being a one day trip, we got plenty of time at each site. This day trip was such a delightful part of our stay in London. Our guide was very nice and knowledgeable. I thought 2 hours at Stonhenge and 3 hours at Bath would be plenty of time, but I was very wrong. We could have stayed the whole day in Bath alone. However, with our already busy schedule of things to do I'm still really glad we did the day trip. The scenic drive was also very enjoyable. Definitely recommend! I booked the day trip after reading good reviews about Viator. and they really exceeded my expectation. The trip is very well organized, the bus is comfortable although we spent around 5 hours driving to and from. Graham the driver was very sweet and most importantly very careful. The Day trip was amazing Stonehenge is a must see if in London. Bath was a beautiful surprising city. What really made that trip so wonderful was our guide Alicia, she is sweet, funny, knowledgeable. If you like history, culture, social stories, you will be extremely well served: Alicia has got plenty of anecdotes for you. Only 10 minutes into the rip and I had learned 3 new things about london and the londoners :)and the cherry on the cake is her sweet voice, it sounded like a young Renee Zellweger; that was exquisite! Amazing day! Great guide that made the day so memorable and enjoyable. So glad we found this day trip.